Tropical forests have been called the lungs of the planet. They soak up vast quantities of carbon dioxide, hold the world's greatest diversity of plants and animals, and employ millions of people. And these hot ecosystems—often a patchwork of trees and grasslands—are being deeply altered by logging and other land use change. 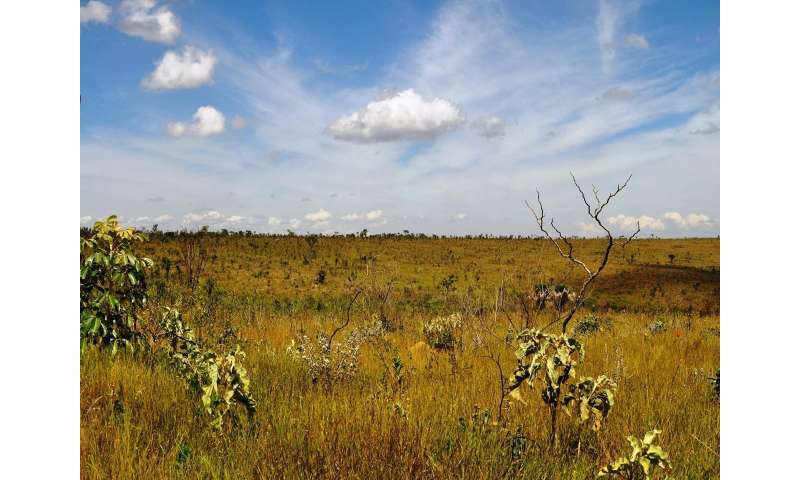 Using high-resolution satellite data from protected forests in the savanna region of the Brazilian Cerrado, the scientists found that the shape of these natural forests follow a predictable mathematical relationship between a forest's perimeter and its area—regardless of its climate region or its size. They call this a "3/4 power law" and it roughly means the forests all tend toward shapes that are neither skinny like a line, nor round and smooth like a circle. "If a forest could grow easily in all directions, we'd expect a circle," says Laurent Hébert-Dufresne, a computer scientist at the University of Vermont who is the lead author on the new study, "but what we actually see is more dendritic, a bit like an octopus or deformed circle." The scientists combined their understanding of real-world data with the results of a new computer model to explain why this happens: fires, that burn easily in the grasslands surrounding forests—and singe the forests' wet edges—are in constant battle with the forests' expansive growth out into grasslands. This interplay at the edge between grass and forest, the scientists discovered, creates forest patches that converge on a steady-state shape. The results of the scientists' model matched the observed results from real forests in Brazil. And an experiment the scientists ran on their model shows that the fate of forest patches over time—whether they expand or contract—is determined by their initial shape. Those with compact shapes of all sizes, over time, converge on the more octopus-like 3/4-power-scaling relationship, while those with skinny shapes and larger perimeter-to-area ratios collapsed, disappearing into grasslands or fragmenting into very small patches. And the new research presents insights at a larger, regional scale into the possible fate of Brazil's forests. "Stepping back and considering the macro scale—not looking at the shape of every patch, but, instead, at the state of the entire system—the model suggests that the collapse from forest to grassland can be dramatic," says Andrew Berdahl, a researcher at the Santa Fe Institute and the senior author on the study. "These local, small-scale effects—perimeter growth and edge burning—can lead to a critical transition across a whole forest region between a forest-dominated-state and a grass-dominated-state." And once large areas of forest switch to grass it can be difficult to recover the forests. "It is like stepping off a cliff," says Berdahl. "You can't simply step back up." Ecologists have historically looked at the elements within a forest to understand its condition—often focusing on its plants and animals—but there has been little exploration of the geometry of forests and how this might matter. The new study shows a powerful role for fire driving the shape of Brazil's tropical forests, "and we'd now like to see if this pattern holds true in other parts of the world," says UVM's Hébert-Dufresne, an assistant professor in the Department of Computer Science and part of UVM's Complex Systems Center. "Say in Africa we find that elephants pushing over trees changes the equation, or dryness in Australia—that would be very interesting." 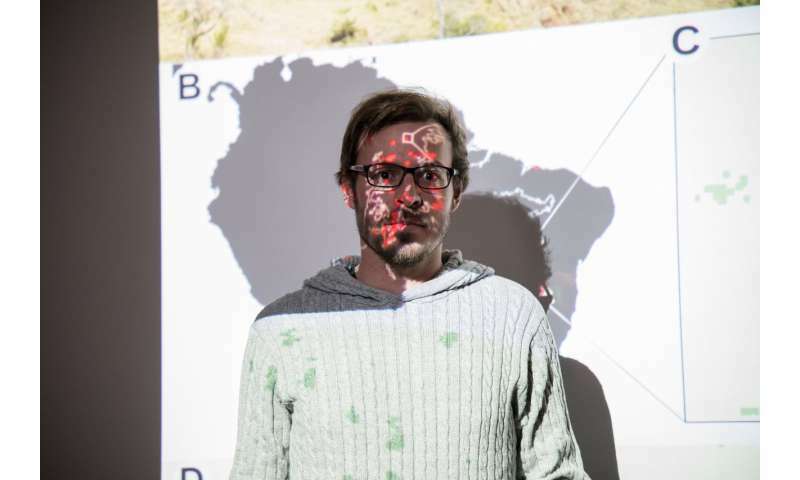 And he'd like to expand the research to see whether the relationship observed in the new model—derived from wild forests—holds true in logged and other managed forests in Brazil. tropical forests were collapsing and forming long before H. Sapiens came along, why worry about it now (other than as a method of gaining control of the means of economic production)?